In parallel with this Month’s Theme, we will be presenting a few choice options from the dealer’s forecourts. 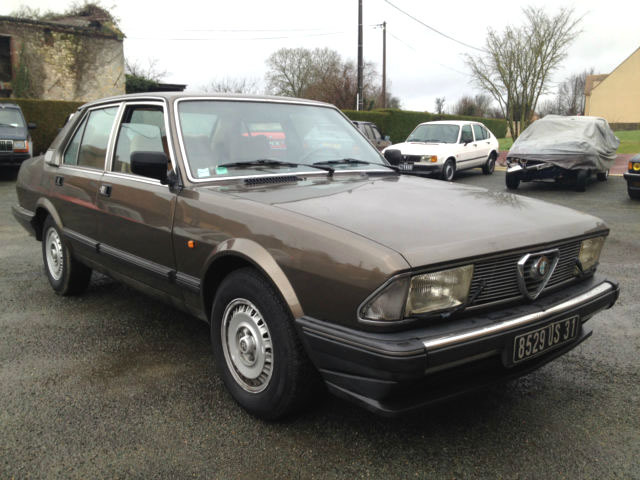 Number one is this example of the scorned Alfa 6. For some reason Alfa Romeo felt obliged to build a large car, but approached it with little enthusiasm, though it was the car that introduced Alfa’s fine V6 engine in 2.5 litre, single-cam form. This example is being sold by a company called Joker Pilot, north of Paris, who we have come across before. It is a Series 2 version with fuel injection and is genuinely secondhand, with just one owner and 45,900 km to its name. As such, it would be hard to find a better example on paper, should you be taken with it – which we certainly are. It is such an oddity, this car. I have seen only one in my entire life, rusting in an industrial estate. You´d want one of these if you needed to be wilfully eccentric and if you liked rust. The rear of the car is heavy and only the treatment of the lights and registration plate panel is of much interest. It´s a high sill too, which is something manufacturers worked hard to avoid as the 80s progressed. In some ways that construction concept is more 1966 than 1985. At the front we have faux BMW forward-angled grille and lamps. I can´t imagine how rectilinear the interior would be, I will go and look. As I thought, very angular but unrefined. The seats’ cloth looks like the stuff BMW used in early 7 series cars. The story goes that the Six was designed before the Alfetta, yet appearances suggest the opposite to be true. The overhangs are ghastly. Alfa Romeo would have been far better served placing the V6 into a standard Alfetta bodyshell, especially given the fact that it was an identical size inside. BMW did quite well by producing the same car with a comprehensive range of engine choices. A V6 Alfetta would have been a far more appealing, honest, (if less imposing looking) car. Lets face it, they couldn’t have sold less, could they? 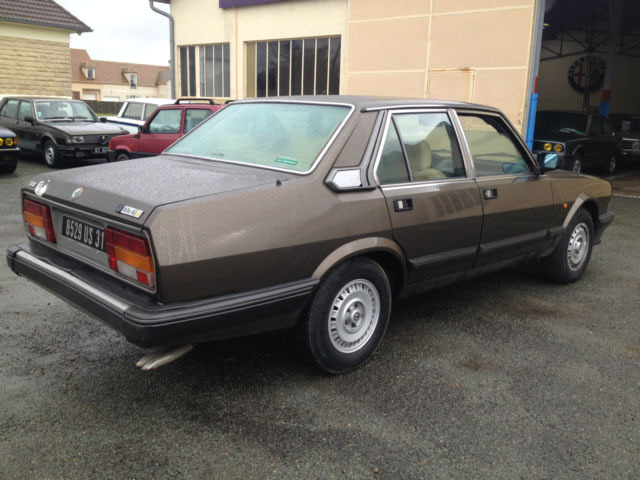 Yes, it almost looks like an Alfetta that they have added rear and front bits to, in an attempt to make it look more imposing. Rather like a VW with a Rolls grille. But, although Alfa were fiercely loyal to their one-size-fits-all wheelbase of 2510mm (Giulia, Alfetta, Giulietta, 75, 90), they really pushed the boat out and gave the Alfa 6 an extra ….. 9cm! Why bother? They were desperate to save money so they kept the one centre section. It saved major work on the doors and perhaps all cars could go down the same assembly line. I agree a V6 Alfetta would have been more convincing.